Today I was privileged to attend a very special event, the Grand Opening of the new Visitors Center at the Joel McCrea Ranch in Thousand Oaks, California. 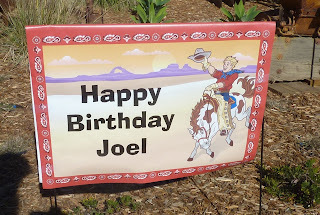 Today's opening was celebrated on the 106th anniversary of Joel McCrea's birth. It was especially neat that our family could enjoy this day with two longtime friends of this blog, Deborah of Sidewalk Crossings (check out her list of favorite McCrea films) and commenter Jane ("Simple Gifts") and her husband. It was wonderful to meet them in person; it's no surprise that Joel McCrea fans are good people! 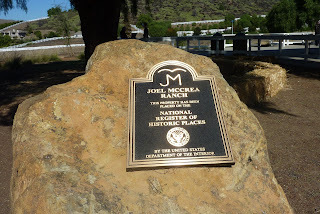 The McCrea Ranch is on the National Register of Historic Places. It was on this cattle ranch that Joel and Frances Dee McCrea lived and raised their three sons, working as ranchers and farmers when they weren't making movies. 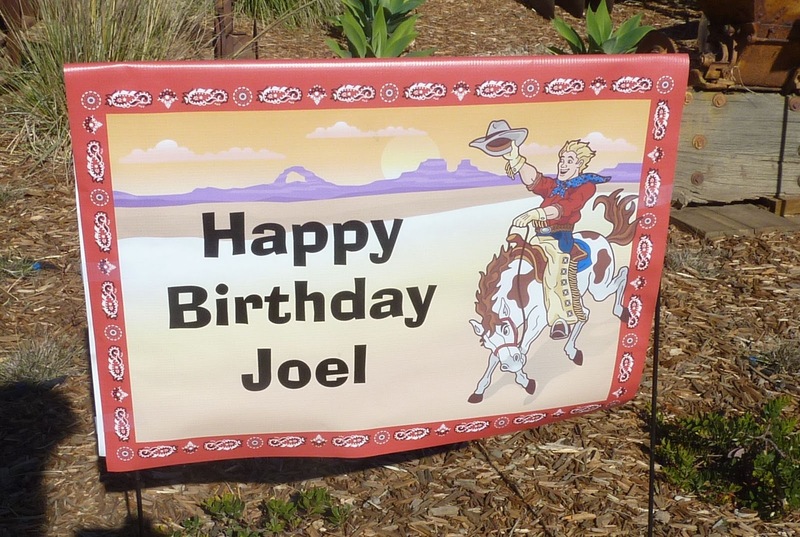 It's an oft-told anecdote that when Joel listed his occupation on his tax returns, he didn't fill in "actor," but "rancher." 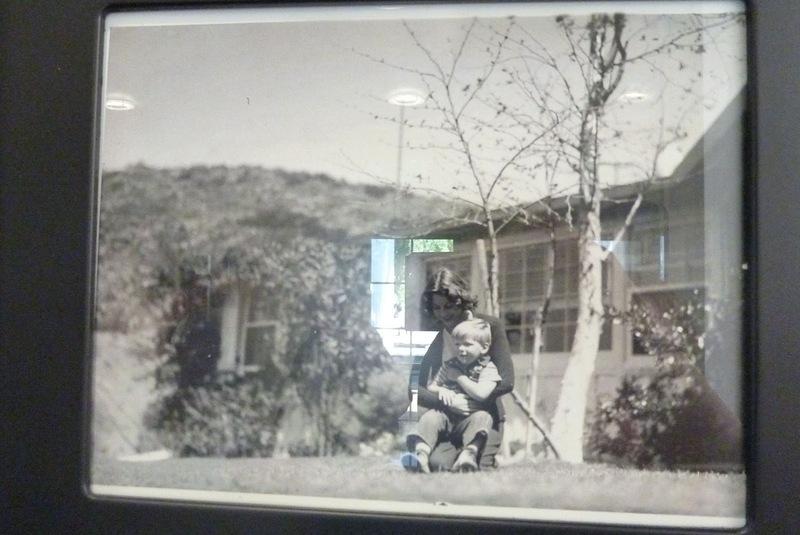 The McCreas eventually sold off some parcels of the land, which formed a significant part of what is now the city of Thousand Oaks, and they donated other portions to various nonprofit groups such as the YMCA. 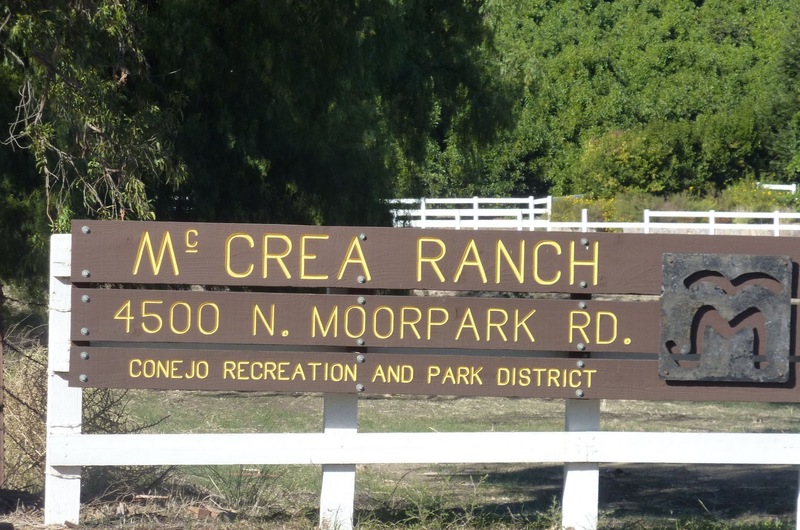 225 acres of the ranch were donated to the Conejo Recreation and Park District, which is working with the McCrea Ranch Foundation to preserve this remarkable slice of California ranching and film history. Inside the Visitors Center, the McCreas' grandson Wyatt introduced the excellent movie which explains the ranch's background. Wyatt lives on the ranch and has been instrumental in leading the effort to restore and preserve the ranch for future generations. The informational film is hosted by Bruce Boxleitner, a familiar face to TV Western fans (HOW THE WEST WAS WON). It includes home movie footage, with portions narrated by Joel's voice telling about his childhood. 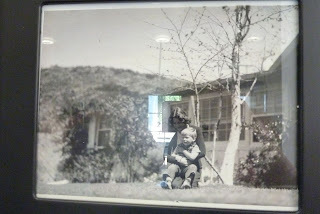 I was told that in her later years, when navigating around the family home became more difficult, Frances Dee moved into the one-time bunkhouse, a small home which can be just glimpsed behind this carport. The McCreas may have been extremely wealthy, due to their careers and land investments, but they lived a very unpretentious lifestyle. The Ranch gift shop had several nice items for sale to benefit the foundation, including T-shirts, notepads, buttons, and water bottles. I told Wyatt I believed there were many classic film fans across the country who would like to support the ranch by buying items from the shop, and he told me that at some point in the future items will be available for purchase online. At present the Ranch is only open on special dates -- upcoming events at the Ranch include a screening of Joel and Frances in the marvelous FOUR FACES WEST (1948) on February 11, 2012 -- but as the Foundation expands, the hope is to bring additional buildings up to code for visitors and establish regular hours of operation which will give the public greater access. Needless to say, I can't recommend strongly enough that fans of Joel McCrea and Frances Dee make it a point to visit the ranch at the earliest opportunity. 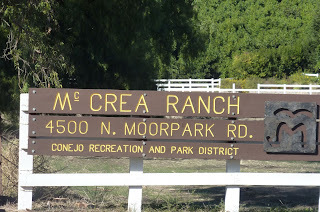 I look forward to making return visits as more of the ranch becomes accessible to the public. Recent local news articles on the ranch: "McCrea Ranch Visitor Center Completed" (Ventura County Star, September 9, 2011); "Late Movie Star's Pristine Ranch Preserved for Future Generations" (Thousands Oaks Acorn, August 18, 2011). For more information, or to make tax-deductible donations, visit the Joel and Frances McCrea Ranch Foundation. 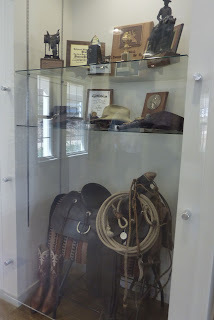 March 2013 Update: A Visit to the McCrea Ranch. An update and more photos! February 2014 Update: THE MORE THE MERRIER (1943) at the McCrea Ranch. I enjoyed this description of your visit. Someday maybe I'll get there myself. I love Joel McCrea as an actor, and admire his productive life and contributions to his community. Now THAT'S a place I would LOVE to visit! Thanks so much for this fabulous report. I feel like I've been there. And I really want to go again!!! The ranch/park is truly a breath of fresh air in an amazing Hollywood legacy. Thank you so much for sharing the experience, Laura. I now have another dream to fulfill. Looks like it was a fun time! I can't wait to visit the ranch myself and take it in in person. The screening in February I think is going to be a must. What an enjoyable recounting of your trip. Sounds like fun. You've given me another vacation idea.